Do you need extra help for EL students? Try the Building Fluency with PunctuationPre-lesson. Students will be able to read with prosody. Tell students that today we will be looking at the comprehension and prosody clues that punctuation gives us in a text. Define ProsodyAs the rhythm and pattern of sounds in language. Write the definition on the board. Explain that when we read with prosody, it helps us better understand what is happening and what characters are feeling. Define PunctuationAs the marks in a piece of writing that make its meaning clear. Have students turn to a partner and explain what you will be discussing, either in English or their home language (L1). Distribute the first fiction passage to students. Ask students for feedback: "Why did my reading sound so strange?" Tell students that you read without prosody because you ignored the PunctuationMarks. Ask student volunteers to share punctuation marks they know. 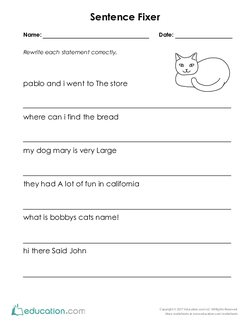 Record them on the chart paper, explaining their clues as you go (e.g. the question mark makes your voice go up at the end of the sentence; a comma makes you take a quick pause). Beginning:Record the definitions of key terms on chart paper for future reference, with images as appropriate. Intermediate:Encourage ELs to turn to a partner and verbally summarize each definition. Read aloud the first two sentences again, this time with prosody. Tell students to reread the first two sentences aloud with you. As a class, read the rest of the passage aloud. Beginning:After reading as a whole class, pair ELs with a sympathetic non-EL peer to practise reading 2–3 sentences aloud with prosody. Intermediate:Have students turn to their desk partner to discuss how punctuation changed their understanding of the story. Assign or remind students of their reading partners. Distribute the second fiction passage to students. Instruct students to begin reading the passage, taking turns reading each sentence with prosody. Remind students to take their time; rushing will make it difficult to understand! Provide visuals for words such as Beak. Allow ELs extra time to complete the work. Intermediate:Before beginning, provide a student-friendly glossary of words and phrases such as EffortAnd Discovery. Support:While others work independently or in partnerships, call your struggling readers into a group to read aloud with you. Enrichment:For students needing a greater challenge, consider the optional game and/or worksheets listed in the materials section as extension activities. While students are reading, circulate the room answering questions and informally assessing student abilities. 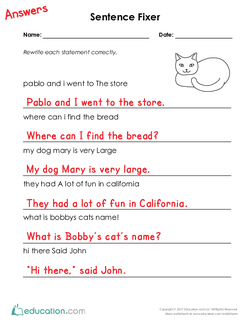 Beginning:Provide ELs with sentence stems to discuss the passage. 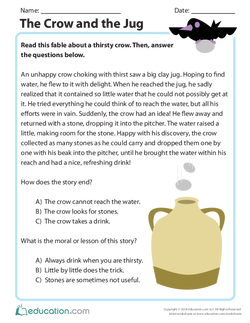 For example: "The crow could not reach the water because _____." Ask students to share the easiest part of reading aloud with prosody. What was the most difficult? Beginning:Provide sentence stems for discussion, such as: "Punctuation helps me _____." Intermediate:Review the definition of prosody. 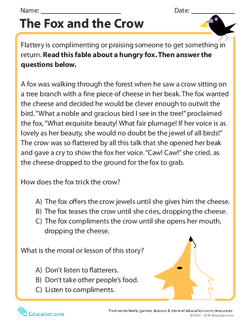 Help them understand how prosody can help their understanding of the text with this reading lesson plan. 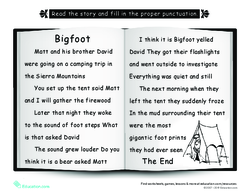 Use this lesson as a stand-alone activity or a support for the Punctuation and Prosody lesson plan.